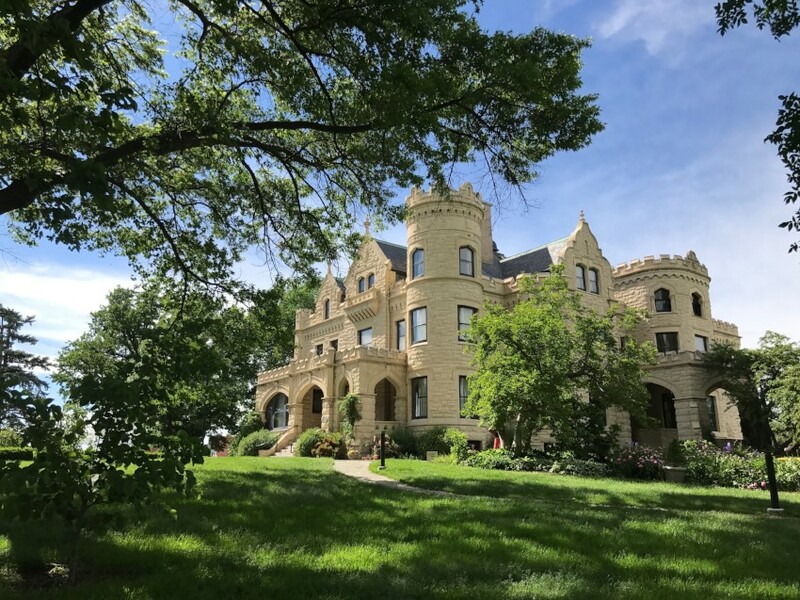 In 1903, George and Sarah Joslyn completed one of Nebraska’s greatest homes—a 35-room Scottish Baronial mansion atop a hill on Omaha’s outskirts. The four-story house was completed at a cost of $250,000—about $7 million in 21st century dollars. The pace of construction—11 months—was amazing, given the rich use of carved wood, stained glass, chiseled stone, mosaic tiles, and wrought iron. The Castle and the carriage house were built of Kansas silverdale limestone. The Castle includes a reception hall, music room, ballroom, a library and gold drawing room. The basement at one time housed a bowling alley. With the addition of a music room in 1906, the house totaled 19,360 square feet. The interior of the home’s conservatory was designed by landscape architect Jens Jensen in 1913. Staff of Omaha Public Schools in the 1980's work in what was formerly Sarah Joslyn's bedroom. George Joslyn died in 1916, in his sixties. Sarah lived on the 5.5-acre estate until her death in 1940 at age 88. 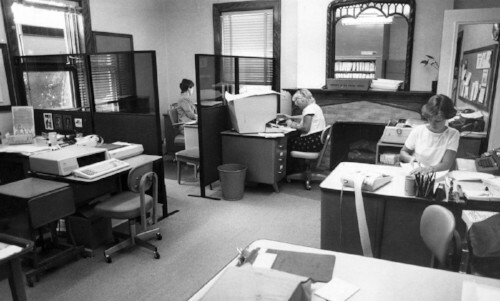 From 1944 to 1989, the home served as the headquarters of the Omaha Public Schools' administrative offices. During their residency, many changes were made to the Castle to accommodate the staff including installation of a modern central heating and cooling system, an elevator, and separate male and female restrooms. To preserve the integrity of this architectural treasure, the State of Nebraska took title 20 years ago, and the Joslyn Castle Trust has managed it ever since. In 2010, the organization purchased the Castle and grounds from the state. 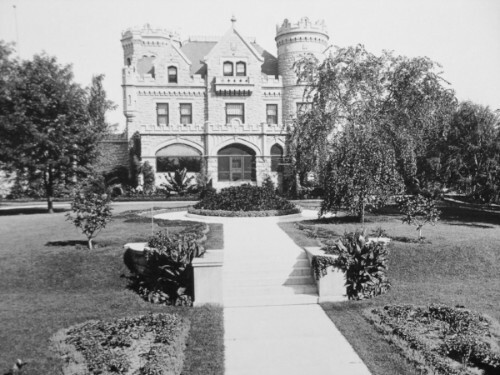 The castle is an Omaha Landmark Historic Structure and on the National Register of Historic Places for national significance. The grounds are part of the Nebraska Statewide Arboretum. The Joslyn Castle is an example of Scottish Baronial Revival architecture, a romantic outgrowth of the 19th-century Gothic Revival movement. Sir Walter Scott, famous author of Ivanhoe, was among the first to incorporate a Scottish Medieval tower house, with its crow-stepped gables, crenellations, and small turrets or bartizans, into a newer private home, but the style can be found in innumerable public and private buildings of this era throughout Great Britain, the United States, and Canada. George Joslyn might have been inspired by railroad tycoon Jay Gould's "Lyndhurst" home in Chicago. Much has been made of the influence of architect John McDonald’s Scottish ancestry on the choice of Scottish Baronial style for the Castle, but the reality is more complex. The Joslyns, like other Gilded Age millionaires, chose a style that would lend an air of old money and sophistication to their newly found wealth and position. 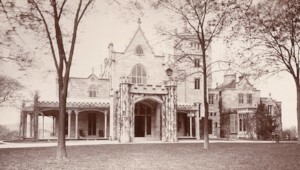 The specific idea of a Castle for their home might have originated in Joslyn’s youth from Union Pacific Railroad tycoon Jay Gould’s greatly admired home, Lyndhurst, with its medieval towers and extensive greenhouses. A third influence was likely that of another “Castle”, the Chicago home of Marshall Field’s founder, Palmer Potter. In the 1890s, the Joslyns would have attended Columbian Exposition receptions inside the Potter’s Castle with its crenelated towers and sumptuous historic revival interiors. 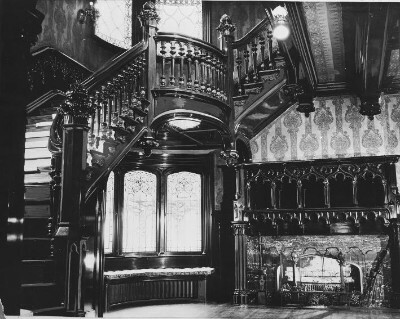 The ornate Grand Foyer with Spanish mahogany staircase and mantle. Lynhurst may look like a Castle, but it bears little resemblance to the drafty stone ruins of Europe. Like other gilded age mansions it was built with both dramatic ostentation and state of the art domestic technology. The gracious hall opening up to adjoining rooms with pocket doors, the carved rare woods, the sweeping staircase, the stained glass windows, a ballroom, an Aeolian pipe organ, and historically-themed rooms were coupled with telephones, central heating, gas, electricity, a refrigeration room, and indoor plumbing with bathrooms for each bedroom, one with an elaborate shower. 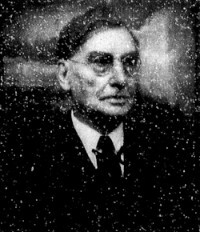 The result was conspicuous consumption rooted in tradition announcing the Joslyns were a couple not only of cultivated tastes, but power and influence.